ENTRIES have opened this week for the Australian Lot Feeders Association’s long-standing industry award, the Young Lot Feeder of the Year. Presented to a young industry member for the past 24 years, the award embodies passion, leadership, development and initiative, and is designed to encourage emerging dedicated employees to contribute their ideas and vision for lotfeeding at a national level. Among the cohort of industry members who have received the award in the past are many who have gone on to represent the grainfed sector through the ALFA council, or other industry representative bodies. The award was first presented in 1994, and has remained a feature of the industry’s BeefEx/Beefworks annual conferences since. Past winners to have sat on the ALFA council have included Michael Doyle (1996), Greg Gibbons (1997), Jason Shearer Smith (1998), Stephen Reynolds (1999), Grant Garey (2000), Gina Lincoln (2002), Geoff Cornford (2004) and Stephen Martin (2013). ALFA president Tess Herbert said ALFA encouraged the growth and development of youth in the feedlot industry, and the award showcased the vast array of talent currently within the industry. “The lifetime contacts and business networks that winning the ALFA Young Lot Feeder of the Year has brought to previous winners is testament to the personal and business benefits of this prestigious feedlot industry award,” Ms Herbert said. As part of the entry process, ALFA asks young lotfeeders to consider current and future potential industry issues that could impact the industry, and propose a solution to this issue. “This process helps to seek and foster qualities that empower curious young lotfeeders to think outside the square, to be bold in their ideas and continuously develop and challenge their thinking about the Australian lotfeeding industry and its future potential,” Ms Herbert said. 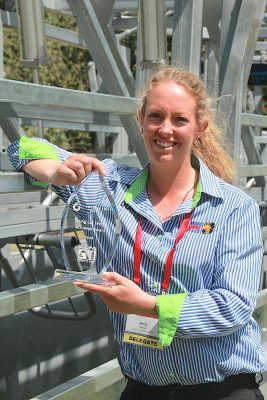 “The broad industry insight, as well as the personal growth and development that the winner of the award can gain through travelling overseas and seeing first-hand how feedlots operate and observe the critical industry issues affecting lotfeeders overseas will prove to be invaluable in that person’s career development,” Ms Herbert said. Three finalists are invited to present their industry issue topic at the feedlot industry’s premier conference, BeefEx, being held this year at the Brisbane Showgrounds Convention Centre on 8-10 October. This year’s conference program includes big data, consumer trends, markets, economics, production, finance and leadership. The award is open to ALFA members and their staff. Entries close 6 July. Stakeholders interested in entering can click here, to download an entry form.